When I first started eating clean, spices were the first magical thing I discovered. My taste buds were changing, and I was able to recognize differences in flavor from the spices alone. I found, and still find, it fascinating that one can travel the world through spices. 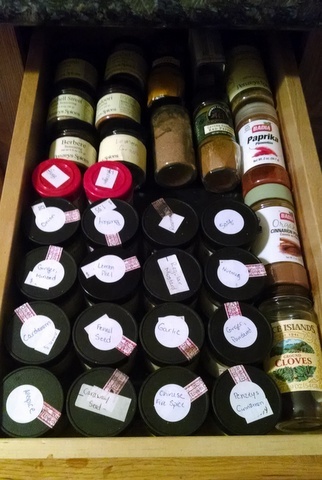 I actually have three drawers full of spices…and 1/2 a cabinet shelf. So today we’re going to travel the world together! If you want your dish to have a Middle Eastern flavor, I’ll give you the spices for that. Chinese? Indian? French? Italian? I’ve got it all. I haven’t figured out all areas of the world (Greek food, I’ll get to you soon!) but here’s a good starting place, especially if you’re new to spices. Chili Powder, Chinese Five-Spice (star anise, Szechuan peppercorns, cinnamon, cloves, fennel), Coriander, Crushed Red Pepper Flakes, Cumin, Ginger. I also like to use Toasted Sesame Seeds for garnish. Ras el Hanout (rahs-el-haNOOT) is a spice blend. Usually vendors all over the Middle East and North Africa will have their own version. This is the recipe I use. It’s delicious! Moroccon/North Africa – my favorite flavor combinations! Cabinet full of spices and spice mixes. I love Penzeys! Well Fed and Well Fed 2 by Melissa Joulwan are two of my all-time favorite cookbooks. I’ll write a full review in a different post someday, but among all the things I love about these books, the thing I love most is the way she teaches the reader to create different ethnic meals through the use of simple base ingredients and a change of spice mixtures. 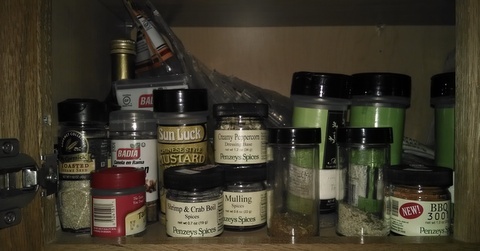 The spice mixes pictured above are from Well Fed 2. The tall jar is Magic Dust, and it’s more than just a spice mix…I use it like a condiment. I also have a few favorite Penzeys spice blends that I’ll share in another post. Question Time! What’s your favorite, go-to spice or spice mix? Answer in the comments! Thank you! I think I have to start buying in bulk. 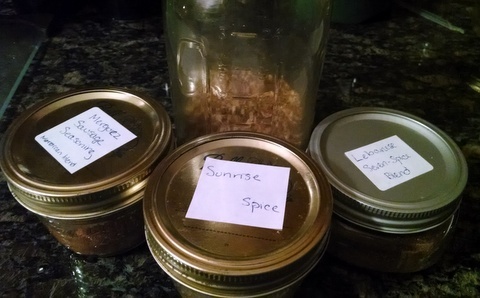 I almost used up my jars of allspice and cumin to make various blends. I noticed I forgot to answer the question: I think my all-time favorite mix is a homemade Montreal: roasted and minced garlic, black pepper, sea salt, and minced onion. That sounds delicious! I tend to use those spices all the time, but never thought to pre-mix them. Yay time saver!